It's 09:28 in Charleston, USA right now. 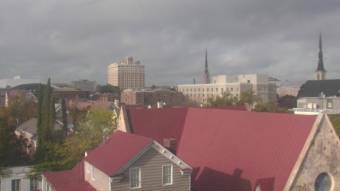 City of Charleston Gaillard Center Webcam and current weather data - camera location: City of Charleston Gaillard Center. Charleston, South Carolina: Joseph P Riley, 0 miles away. Sullivans Island, South Carolina: Fire Department of Sullivan`s Island, 5.5 miles away. Isle of Palms, South Carolina: Surfcam, 10.4 miles away. Fripp Island, South Carolina: Tarpon Blvd Ocean Front, 45.3 miles away. Orangeburg, South Carolina: Fairey Chevrolet , 72.8 miles away. Savannah, Georgia: Savannah Hilton Head International Airport, 83.3 miles away. Myrtle Beach, South Carolina: North Beach Plantation Resort, 87.3 miles away. North Myrtle Beach, South Carolina: Avista Resort, 101.9 miles away.